Surrounded by soft meadows and a serene salt water marsh, The Meadows has been designed to be both a beautiful and functional environment in which your every need has been anticipated and planned for. 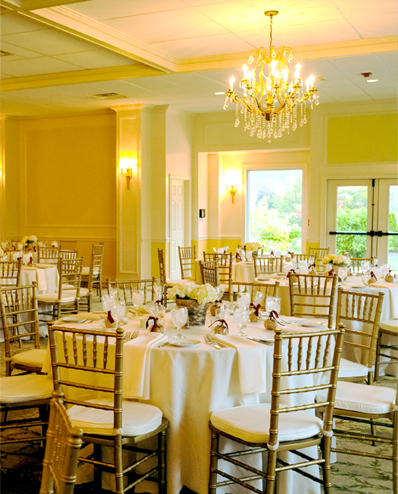 The Meadows can accommodate up to 250 guests and limits its use to only one event at a time. It’s close proximity to many area attractions make it an easy destination for you and your guests. If you are planning an outdoor ceremony, the covered patio can provide a rainy day alternative thus eliminating the need for a tent. The stone terrace covered by a beautiful white pergola overlooks green rolling hills and is a shady and relaxing environment for cocktails as you welcome your guests. The elegantly designed ballroom is revealed after cocktails and invites you in for a romantic reception. For 2015 we have formed a new exclusive partnership with Gourmet Galley Catering to assure an unparalleled experience for you and your guests. We now have the added amenity of a new, stunning bridal suite with its own private lounge and entrance for your enjoyment. The lounge can also be used to host a family dinner or party after the rehearsal ceremony. For more information on our weddings click here.